Opinion | Discovery Channel's "The Boy With Divine Powers"
Discovery Channel's "The Boy With Divine Powers"
Kathmandu, Nepal -- Ram Bahadur Bomjon "Buddha Boy" is a 15-year old Nepalese boy who was hailed by many to be Buddha incarnate - 11 months without any food, without any drop of water - just silently meditating in a tree-hole (like the Gautama Buddha). Mysteriously he vanished one day - as of March 2007 he is known, however, to be safely meditating in a pit in Ratanpuri village. Discovery Channel last year had a feature on him in their show "The Boy With Divine Powers". Conclusion? It might not really be such a great hoax as everyone might have thought. Some time ago, the Discovery crew had arrived at the village of "Buddha Boy" (BB) - and they had found it to be now a huge secondary industry area as devotees arrive and buy and sell merchandise related to BB. Just a year ago, this had been but a simple farming village with little contact to the outside world. "Buddha Boy"-commercialized so it seems - and immediately the narrator indirectly seems to suggest a hoax in the making as hundreds of jobs are created and giant profits reaped. The crew moves on to the center of attraction - the site of BB's meditation. Surrounded by fences, BB sits there serenely in the tree-hole, as 50m away barbed wire and guards isolate him from the touch of the world. The security system is elaborate and tight - heading the "safety committee" responsible for BB's welfare and security is BB's brother, who the camera crew attempts to seek permission from in order to film BB to investigate the issue. The brother is the only key-holder to the fortress he has erected around BB. Fences? Discovery starts to question the purpose of such "precautions". Coincidence? BB's mother is named Maya Devi. Rings a bell? The mother of the historical Buddha Gautama Siddharta, goes by the same name. The brother initially declines, but quickly allows the crew to film the BB - but the closest they may get is 25m away from the boy. The crew agrees, and a camera is left there to face BB for the next dozens of hours. Hours pass. BB is just as composed as he was initially, with no heed to the outside world ogling at him. No intruders - no visible means of food/water being passed to him, nothing to suggest any foul play at all. Later in the show, the brother leads the crew to his house (while the camera is left intact). Little has changed since BB got commercialized by the people. Donations flock daily in thousands of rupees - but the brother sincerely tells the crew that the money is used for running the site and paying for guards etc. etc. while the remainder is kept in the bank - Discovery seems convinced that nothing out of BB's commercialisation is being used for the brother or his family's personal profit. The brother informs the crew that the BB, after some weeks in a Sakyan monastery, returned home one day to inform his family that he would spend six years in deep meditation till enlightenment. 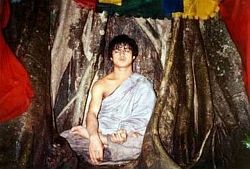 Three months passed as he meditated every day in his tree-hole, until his brother erected the embankments around him to keep him from being disturbed and he entered deep, deep meditation. A day passes, and BB shows no signs of dehydration/hydration as predicted by nutritionists. No cracked lips, no yellowed skin. Zilch - he looks completely healthy. Somewhere after a day, the boy starts sweating profusely. BB's teacher is called in to the site close to BB. A Buddhist monk of the esoteric Sakyan school, he identifies the yogic method BB is using after an hour of meditating in front of him (in some kind of duo meditation) - "tumo"- where the meditator reduces heat loss and maintains a high body temperature. The teacher attempts to "lessen" the "importance" of BB by informing the crew that he knows of many lamas in the Himalayas who, like the boy, are doing just such stuff. Villagers inform the crew that the last time the boy sweated so profusely was when he was reported to have been bitten by a snake. In this region where a poisonous snakebite can kill a person instantly, the boy simply "sweated the poison out" literally then, and continued his meditation throughout - to the amazement of all. Second day - and where blackened lips and blood ought to come out from his skin, BB remains motionless and totally healthy. No food, no water. It is midnight, and temperatues drop to around 10 degrees Celsius. Pilgrims, guards, Discovery crew, and even the Nepalese government's commission shiver under the cold despite thick blankets and coats - yet BB with his thin clothes continues to sweat, unfazed by the cold. The Nepalese government's commision here has been filming BB for 6 days now - and no trace of him obtaining any tangible source of nutrition anywhere. Third day, and the safety committee seems to be in chaos. A power struggle breaks out and BB's brother is left out of the main picture. Something is very wrong. The camera crew is interrupted, and they leave. Some weeks later, they return to the site and are allowed to film once more. They hear some shocking news. Some time in January, 59 people bore witness to BB spontaneously combusting before their eyes as flames shot out from him. He was reported to have shouted for his brother to throw a red robe over him - which was obeyed, and BB continued. A commercial gimmick to generate more interest? Discovery appears skeptical still. The scene is changed - as a 80-year old Hindu brahmin, claiming to not have eaten or drunk anything since 16, is tested by medical science. For ten days, his neurosurgeon keeps him in an isolated ward 24/7 observed by cameras - never leaving him. Even when he showers, the amount of water given to him is measured before and after use to prevent any foul play. No toilet breaks are needed. The medical team is astonished to find that whenever urine builds up in his bladder, they quickly just "pop" and disappear without a trace! Despite all forms of checks, scans, secret cameras, secret spot-checks, everything that could be thought of - the medical team, skeptical at first, eventually is forced to conclude that he is not a hoax - surviving at least 10 days without food nor water. The neurosurgeon-in-charge suggests that the brahmin is literally photosynthesizing to obtain energy - much to the shock and disagreement of other scientists - that we, carbon-based humans absolutely just cannot make food from the sun! Taking in every single factor, a nutritionist ultimately concludes that even with the smallest calorie requirement a day, BB MUST have some form of nutrition source. Anyway, however such meditators may be taking their energy from, the lamas interviewed seem to suggest some method of "eating from the breath" where he directly absorbs and uses the elements found in the air. Shocking? The camera crew films him again for days. He should have died - but for some reason, he escapes Death again and again. On one of the nights, a blue halo is reported to be emitting from the boy's forehead - even though the crew could not catch it. The villagers are awoken to reports of a tiger in the camp on another, as the security committee finds tiger footprints on the ground. Discovery realizes the purpose of the fencing - it is not to keep him in (to make a hoax) but to keep stuff out (to protect him). Discovery concludes that if it is a hoax, where the boy actually is being fed secretly,it must be really intricate, really elaborate, really - unfathomable. Now Discovery no longer so much doubts the "no food/water intake" of the BB - but now they question if the boy is being starved before their eyes actually - for money. The brother now seems to have lost total control of the committee - he walks off sadly to his house, but tells the crew that whatever the outside world may think, six years later, BB will come to prove them wrong - and will come to enlighten mankind. In March, some time after the Discovery expedition - the boy disappeared. Kidnap? Gone to deeper forests? Whatever the reason - the effect is evident. The throngs of BB commercialisation has gone, and the village is now back to its primary industry just like in the past. The boy is forgotten totally, as pilgrims vanish. The only reminder is the fences that still stand, still unbroken by time. Be him an incarnate, be him kidnapped or eaten up by tigers - it is no doubt that he indeed had used Buddhist meditation powers to cause him to go into some sort of "hibernation". The pilgrims of the past were mostly mainstream scientific individuals, and the many skeptics to his repute return believers. Medical science should be rewritten, as the show ultimately seems to conclude as a believer from the skeptic it first was. The human body can indeed live without food or water. Buddhist meditation is not something psychological. NOTE: This article was written last year, 4 September 2006, for a Buddhist discussion site. It has been slightly edited for the Helium.com audience and content updated.